Yesterday California apparently made a big endorsement of the CHADEMO DC Fast Charge standard, a potentially ill-fated decision depending on a decision expected from the SAE J1772 committee this summer. Yesterday Gov. Jerry Brown announced California had settled a lawsuit with NRG, and that part of the agreement was for NRG's eVgo subsidiary to build a large electric car charging station network. 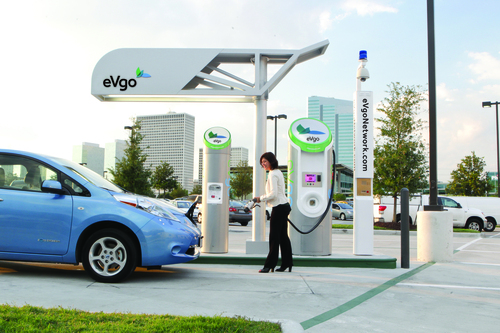 The network will include over 200 DC Fast Charge stations in California's major metropolitan areas. While deploying electric car fast charge stations has been shown to improve EV adoption, it means California is stepping into the middle of a controversy over electric car fast charge systems standardization. This could become an expensive mistake a few years down the road. To recap yesterdays announcement, in the agreement NRG is committed to investing $100 million in building an electric vehicle charging network in California, to expand the eVgo network in that state. Part of the network will include "a minimum of 200 direct current (DC) fast chargers" which can "add 50 miles of range in less than 15 minutes of charging." This specifically means that California is endorsing the CHADEMO DC Fast Charger system utilized in the Nissan Leaf and Mitsubishi i-MiEV. CHADEMO is the only system which will be available in the time-frame required by the agreement (the next four years). This may be an ill-fated endorsement of CHADEMO depending on what the SAE J1772 committee decides for electric car fast charging standards. The CHADEMO fast charging system is widely used in Japan, was developed originally by TEPCO (Japan's electricity company) and has been implemented in electric cars by several automakers in a half dozen electric cars, including the Nissan Leaf and Mitsubishi i-MiEV. Additionally, several companies are manufacturing CHADEMO compatible fast charging systems. This is a technology in daily use in Japan since 2008, with plenty of happy users. At the Plug-In 2010 conference, TEPCO's Mr. Anagawa presented data and experience with the CHADEMO network in Japan. Anagawa-san showed that once CHADEMO stations went into use in March 2008, electric car usage in Japan shot up dramatically. By the summer of 2010 there were already 250 CHADEMO chargers in use around Japan. This shows electric car fast charging infrastructure will spur adoption. With CHADEMO the Leaf and i-MiEV can get an 80% recharge within 30 minutes. The cars limited to the modest 3.3 or 6.6 kilowatt charge rate require a multi-hour full recharge, making those electric cars unsuitable for long distance trips. Electric cars with fast charge capability can be suitable for long trips, given existence of compatible fast charge stations. Which leads us to our controversy. Unfortunately the automobile industry does not agree on a single fast charging standard. The SAE J1772 committee, the group in charge of electric vehicle charging standards, has refused to adopt simply CHADEMO for SAE's DC Level 2 charging. Instead the SAE committee, led by Gery Kissel of General Motors, has a preference for only one charging port on electric cars, and CHADEMO would require two charging ports. Reports indicate the committee is unlikely to select CHADEMO but instead choose a modification to the current J1772 connector to support extra pins for DC Fast Charge. A vote is expected in July or August 2012, that may result in the rejection of CHADEMO. Additionally the fast charging territory is even more complex, because Tesla Motors (bless them) have gone and designed their own proprietary fast charging system that's incompatible with both CHADEMO and the system favored by the SAE committee. What's the current status of fast charging plans by different automakers? Nissan and Mitsubishi have chosen the CHADEMO standard, and are currently selling one electric car apiece, in the U.S.A., using that standard. NIssan, interestingly, has been chosen to provide Leaf electric cars for an electric taxicab pilot project in New York City. This will lead to deployment of electric NV-200 vans as electric taxicabs. Taxi service seems ideally suited to fast chargers, so the taxi's stay on the road for more hours of the day. Is NYC also endorsing CHADEMO? Ford and Coda are using a J1772 port running at a 6.6 kilowatt charging system, which both companies tout as twice the charging speed of the Nissan Leaf. In truth it's only an advantage if the Leaf owner cannot access a CHADEMO compatible DC Fast Charge station. Tesla Motors has taken a proprietary go-it-alone approach. The charger connector on the Tesla Roadster, Model S and Model X is incompatible with even J1772. Tesla's on-board charger on the Model S and X supports either 10 or 20 kilowatt charging rates, even faster than the 6.6 KW rate touted by Ford and Coda. Additionally Tesla's system supports what that company calls a "Supercharger," a fast charging system incompatible with both the CHADEMO design and whatever will come out of the SAE J1772 committee. Tesla apparently plans to begin installing a network of Supercharger stations beginning this summer. In short there is a huge mismatch between the automakers on fast charging methods. In the previous era of electric car adoption, one hindrance was the disagreement between charging technologies. That debate was between inductive and conductive charging ports. It meant every charging station location had both kinds of station installed, inconveniencing everyone. It will be much better for everyone if there were one standard for DC Fast Charge. Nissan issued this statement praising Gov. Brown's decision: “Nissan applauds California Governor Brown’s clear vision and strong commitment to electric vehicles through the $120 million investment for the creation of the Electric Expressway. California is leading the way in fostering the growth of electric cars, such as the zero-emissions Nissan LEAF. More than 40 percent of the 11,000 LEAFs sold in the United States are on the roads in California. Today’s landmark commitment, which will bring more than 10,000 electric-vehicle charging points to the state, paves the way for widespread adoption of this critical technology.” What Nissan didn't say is that the decision to install CHADEMO DC Fast Charge systems helps Nissan (and Mitsubishi) at the expense of other car makers and their choices for fast charging connectors. Obviously fast charging availability will make electric vehicles more attractive, and on that level California's decision to endorse building a network of fast charging stations is a good thing. But it means California is endorsing CHADEMO in a big way, putting California at risk of having made the wrong decision. At the same time the delays by the SAE J1772 committee have hindered adoption of todays electric vehicles, because the lack of fast charge stations is less attractive to electric car buyers. 200 isn't a huge number compared to the 10,000 they are building that are j1772. In terms of availability, having only 2% of their planned stations being ANY new/risky fast-charging standard? That seems acceptable, compared with not having any fast-charging. I'm glad they at least picked that standard that cars on the road are using at the moment. Either path was a risky one, I'm glad they chose to spur adoption. This is true, plus none of the SAE quick charge supporters (Audi, BMW, Daimler, Ford, GM, Porsche and Volkswagen) offer a BEV today. Ford is close and BMW will lease you one. So how are these guys in any place to dicate a spec for a capability they themselves don't offer nor in many cases even plan to. Shame on SAE, it's just pure FUD. As I write this it reminds me that ISO was supposed to replace TCP/IP in the early 90s. California should go ahead with CHADEMO or we won't have anything deployed in the US for years. Yes, I know about that history, 20 years ago I worked for a company that made both TCP/IP and ISO software stacks for several operating systems. It's a good thing that TCP/IP won... but that was at the cost of Microsoft making a decision, by fiat, to put TCP/IP into Windows, and that decision resulted in the death of a group of TCP/IP providers. In the 90's charging EV's was a mess. Each manufacturer had their own 'standard'. We do this time around have a Level 2 standard worldwide. Yippie!! However the fast charging does not have a universally agreed standard and is in danger of repeating the charging confusion that stymied EV's back in the 90's. Standards organizations are slow to ratify standards, Nissan and Mitsubishi at least have deployed fast charging and as a result ChaDemo is a de-facto standard right now. Tesla have their own proprietary quick charge standard for the S and X models. Until Ford or GM actually announce a vehicle with fast charge capability, the SAE standard is irrelevant. Now there is a de-facto standard so SAE *should* design the communication between vehicle and charger to be compatible with the ChaDemo standard so EV'ers can use adapters. My guess is they will make it totally incompatible and we will see a standards war in the US. The consumer confusion will deter EV adoption. Companies that make Level 3 EVSE's will be torn between meeting the needs of current EV's on the road and the promise of newer models in the future. This will only serve to drive their costs up until a winning standard emerges. Will EVSE manufacturers 'choose sides' or will they put two connectors on every EVSE, those chunky Level 3 cables and plugs don't look cheap. If the SAE standard wins, the value of the ChaDeMo port on Mitsubishi and Nissan EV's will become increasingly worthless and retrofit is unlikely to be cheap if even it is made available. What a mess. 200 QC stations in California is actually a perfectly adequate number for the major metropolitan regions. For a Nissan Leaf, this extends the daily driving range, starting with a full tank, from two hours of driving to three hours of driving, with a twenty minute break for a meal and a Quick Charge somewhere in that day. If you're going to be driving more than three hours a day, you need to have a car with a gas tank. And who cares a whit about any standard that the SAE might develop? Nobody makes cars that use this standard, and nobody is going to build a second charging network to use this yet-to-come standard when the rest of the world has already moved past the sluggish Americans. The real questions are about the devil in the details of the contract with NRG. Is this a settlement, or is NRG creating a nice, unregulated monopoly of EV charging for themselves in California, squeezing out Blink and Coulomb? I think it will matter in 10ish years when GM/Ford/VW/etc finally start selling cars with the SAE standard connector, but CHADEMO is the defacto standard. It's a decision today that will affect what occurs on that future day. As for the details of the settlement - yeah, good points, and if you look at the previous article on this (follow link in the article) you'll see I raised the same questions. It is not a settlement in the normal sense of "settlement". NRG describes it as a business investment in building a business, not that they paid a fine. What isn't clear is whether Blink/Coulomb will get squeezed out. This is great because California has the most EV's in the country and only two functioning DC fast chargers (Mitsubishi HQ and a 7-eleven in San Bernadino). I agree that 200, well placed chargers will make a huge difference in adaption. Fast chargers aren't needed in large numbers like gas stations are because an EV primarily charges at home. U.S. auto makers are not serious about making electric vehicles, that is very clear. Only Ford has an EV and they don't seem to have much confidence in it, evidenced by the lack of road test reviews. So why wait for SAE and car makers that don't mass produce the product? Waiting would benefit no one. I see CHADEMO being widely distributed with the low-cost Nissan charger. By the time one of the other manufacturers starts to sell a car that has the new SAE connector, it will need a CHADEMO adaptor. If the SAE standard does become dominate, then an adaptor will have to be used for CHADEMO cars. It seems that SAE and the group of auto-makers think that EV's are off in the distant future, once again missing the boat. The blame really falls on US can OEM's and the SAE Standards body, in making this simple design decision so laborious. For those companies deploying EVSE stations for DC Quick-Charging, only existing Protocols can justify the high expense of deployment and at the moment, ChaDeMo is "it". To look at it another way, even if the SAE had ratified the Standard, THERE ARE NO US-BUILT EV's or PHEV's that currently feature DC Charging. If the State of California held-up deployment waiting for US Cars to "catch-up", sales and therefore utilization of EV's might be "stalled". Those of us in the business are planning to add/modify EVSE equipment to accommodate US SAE Protocols once there are sufficient numbers of these vehicles on-the-road. NRG is a good firm and has plenty of capital to extend their deployment to include SAE Standards when the time is ripe. 200 DC Chargers in CA is a "drop-in-the-bucket" against the backdrop of totals required to foster a healty EV "Ecosphere" throughout the state. My hat is off to these early participants-remember, they have to build a credible brand now, if they are to continue investing in CA in the years ahead. EVSE Equipment manufacturers will build "Dual Protocol" units with a plug of each type on their respective sides for ChaDeMo/SAE compliance. ChaDeMo is forever the "legacy" Protocol and ChaDeMo vehicles will be on the road for many years, so there is no way we can ignore them at the outset, or include an as yet non-existent "fleet" until the vehicles materialize. As CA. Power utility companies are not allowed to own/operate EVSE networks and NRG is a TX-based utility, perhaps some consideration should be given to that area of the "puzzle". 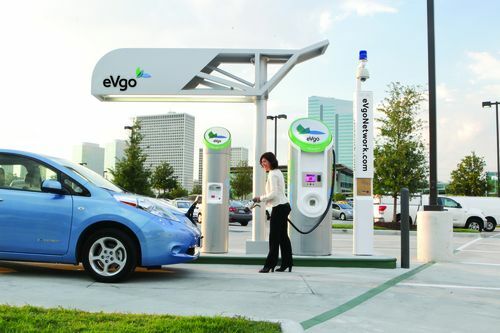 Maybe PG&E, Edison and Sempra should consider building car-charging networks in Texas. Either way, for EV's to become a mass-market product, this infrastucture has to go in and someone has to pay for it. Ecotality used GovGrant money-NRG (I assume) is using private capital. The real "Elephant in the Living Room" are the huge utility Demand Fees which are incurred in CA. when delivering 50Kw Quick-Charging. Without batteries to act as "buffers" on Quick-Charge installations, the cost of energy can be so high that a driver would have to pay $30 for a half-hour (80 Miles of range) session on the EVSE-QC. At least the lawsuit has been settled. Good news in the short-term as the infrastructure is badly needed. If Nissan wants CHADEMO as the standard, why don't they make it the standard on all the Nissan Leaf cars. Go figure. Huh? it is the technical standard on Nissan Leafs. My Nissan leaf has a CHADEMO port. No it isn't. Only on Nissan Leaf SL car. Nissan needs to put CHADEMO port on all Nissan Leaf car. Make it the standard on all Nissan Leaf cars. I realize what you are saying now ('come standard equipped' vs 'chosen technological standard'). Still, Nissan has chosen to support CHADEMO -- it's a japanese-born standard, after all, why wouldn't Nissan support it? They sure as heck won't switched to whatever standard SAE proposes, unless forced by the market... So, I guess I'm still confused by your statement. Electric cars are evolving quickly. I've heard talks that the 2014 Leaf will have inductive, wireless charging. I think it's assumed that the rapid progress will leave some Leaf models without newer features -- mine included. I won't be griping when newer models start getting nice things like battery capacity upgrades and faster charging methods, progress is good! Not all Nissan Leafs have a CHADEMO port. Nissan needs to make it the standard for all their Nissan Leaf cars. Not all Nissan Leafs have CHADEMO port. "CHADEMO is the only system which will be available in the time-frame required by the agreement (the next four years)" Not true. The SAE fast charge system is now official. They can easily build fast chargers with the SAE system. Yes, it has only recently been approved but makers of this type of equipment have known about the specs for a long time. They'll be able to roll out chargers pretty quickly. Official does not mean ready (or sensible). When does the first car using SAE fast charge hit the road, and how long until the number of SAE-quick-charge-compatible cars outnumber the CHADEMO ones? "first vehicles to use this system will reach the market in 2013". I would understand some sort of compromise which both plans ahead for the SAE standard AND provides access for the tens of thousands of CHADEMO cars that will be on the road by then... but as it is, most of the stations being built with this plan are level 2 J1772, which will be supported by everyone. My (biased, leaf-owning) opinion: Build stations we know will be used, and if demand ends up being there, build more or retrofit the current ones. Nissan and Mitsubishi win the leading advantage in this case.